The first two nonfiction titles support the Grade 4 study of rocks and minerals. 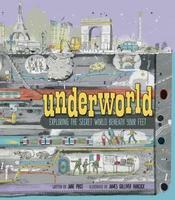 The strength of Underworld: Exploring the Secret World Beneath Your Feet, by Jane Price, illustrated by James Gulliver Hancock, lies in its cartoonlike cross-sections and cutaways of the earth. Rocks and minerals are covered in Chapters 1, 2, and 6. This book has a lovely, accessible feel, mainly because interesting facts are sidebars to Hancock’s easily readable illustrations. For example, in Chapter 1, “Underground, Earth’s Crust and Below,” shows one inclusive cutaway depicting the layers of the earth and the three types of rocks. Tectonic plates, fold mountains, tsunamis, earthquakes, fossils, volcanoes, etc. are all shown to be interconnected. Similarly, in Chapter 2, “Holes in the Ground, Crystals and Cave Cities,” all types (e.g., prehistoric, underwater, stalactites, stalagmites) are plotted in one illustration, followed by photographs of spectacular caves around the world and how they are formed. Chapter 6, “Digging for Riches,” explores mining and the whole resource-based industry, including a feature on the rescue of 33 Chilean miners in 2010. Canada’s Rocks and Minerals, by Joanne Richter, is perfect for independent research. A manageable amount of text in five easy-to-read chapters covers these topics: (1) how rocks and minerals are formed, (2) Canada’s significant geological areas, (3) crystals and gems, (4) Canadian fossils, and (5) how to be a collector. There’s a map of Canada showing areas of common minerals. The next two novels are great read-alouds, followed by some fun picture books, ideal for integrating Language and Science. In A Trail of Broken Dreams: The Gold Rush Diary of Harriet Palmer, by Barbara Haworth-Attard, Harriet’s mom dies on the first page. It’s 1862. Harriet needs to find her father who is staking a claim somewhere in BC. Twelve-year-old Harriet worries about her fate and that of her siblings, so she dresses as a boy and joins the carts going west. The first half of the book describes the arduous journey, including Harriet being bullied whilst trying to maintain her disguise. Midway through, Harriet reaches her destination and there, the reader is privy to a description of the gold fields and different methods of mining. The epilogue tells of the historical accuracy of the book with background information about the “Overlanders.” Also described are the processes of panning, rocking and sluicing, along with photos and sketches of the windlass and Cornish wheels, common tools involved in mining at the time. 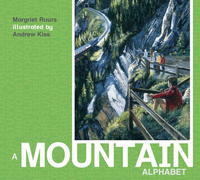 A Mountain Alphabet, by Margaret Ruurs, illustrated by Andrew Kiss, is a visual overview of mountain ranges. Ruurs’ intro includes some rudimentary information about the west coast of Canada, the purpose of mountains, their origins and changes due to weather forces. She also invites a treasure hunt, with each illustration holding a hidden letter and specific objects beginning with those letters. Who Wants Rocks? 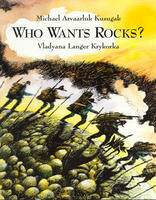 by Michael Arvaarluk Kusugak, illustrated by Vladyana Langer Krykorka, explores the effects mining has on the environment. It’s the story of Little Mountain and Joe, an unsuccessful prospector in the Yukon Rush. While everyone else gets rich, Joe watches the mountains being dismantled around him. He finally realizes true wealth lies in enjoying fresh air, the sounds of nature and the view of Little Mountain, still intact. 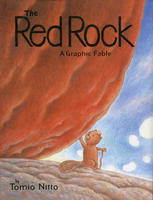 The Red Rock, A Graphic Fable, by Tomio Nitto, is part picture book, part first-foray into graphic novels. A developer comes with the World’s Biggest Smartest Project: tear down a forest to build a dam to power a casino/spa. But there’s a weird spherical red rock smack in the middle of his plan. The animals try building barricades to no avail. One night a lightning bolt from the red rock infuses the beaver with super powers: the ability to persuade the developers to change course. A good discussion-starter around environmental issues. Sam and Dave Dig a Hole, by Mac Barnett, illustrated by Canadian Jon Klassen, is a whimsical story of two boys digging for something spectacular. Their tunnel, however, keeps missing the mark. The reader sees the hidden diamonds whose sizes increase with each detour. A fun read that’s also great for inferencing: not only do the characters make inferences based on what they are NOT finding, the reader also makes inferences based on Klassen’s clever details, e.g., the dog, the weather vane, and the fruit tree. The Shooting of Dan McGrew, by Robert W. Service, illustrated by Ted Harrison, creates a vivid description of the Gold Rush and some characters that might have inhabited the North. For example: “A half-dead thing in a stark, dead world, clean mad for the muck called gold.” A forward by Harrison gives a bit of background to the poem about a deadly saloon spat. 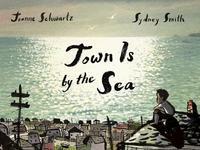 Town Is By the Sea, by Joanne Schwartz, illustrated by Sydney Smith, is a father-and-son story whose flowing language creates a beautiful portrait of a coastal mining town. “First thing I see when I look out the window is the sea. And I know my father is already deep down under that sea, digging for coal,” writes Schwartz. Cool facts for aspiring rock-hounds!